Pretoria - After three losses on the trot, SuperSport United got back to winning ways with late goals in the 2-0 victory over University of Pretoria at the Lucas Moripe Stadium on Saturday evening. 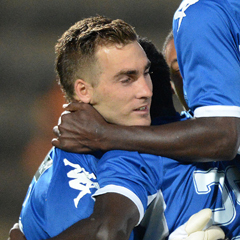 Bradley Grobler was the catalyst in the hard-fought win as his brace saw Matsatsantsa march away with the points. Grobler grabbed his first goal in the 77th minute when he capitalized on a mistake by Grant Kekana in the box. In the 89th minute he completed his brace after Thuso Phala provided him with the assist after beating Siyabonga Shoyisa on the corner. In the opening stages on the match United flooded the opposition with penetrative attacking play on the flank but Matsatsantsa were still unable to dominate. United winger Phala offered the home team width on the left side where he looked to attack defender Grant Kekana head-on. In the 12th minute United players combined well when Phala and David Mathebula played some quick touches that suggested that the university club would be in for a hard day's work. But AmaTuks defender Siyabonga Shoyisa was not going to let the United attackers have their way and in the 23rd minute he swept the ball away from Phala with a brilliant tackle. Having deployed an ultra-attacking team, United were at times caught napping on defensive duty with some players lacking urgency to get behind the ball. Minutes before the half-hour mark Dove Wome failed to backtrack his opposite number and Matsatsantsa were caught on the counter-attack. Midfielder Mpho Matsi play through his teammate Thabo Mnyamane with a long ball, but fortunately for United goalkeeper Ronwen Williams did well to scoop the ball on the edge of the penalty box. At the interval the encounter had been an evenly poised with neither side having taken the driver's seat. In the second half AmaTuks were the first to get a scoring opportunity through striker Lucky Mathosi, who powerful shot outside the box was collected by the goalkeeper. When it appeared as though the clash would be headed to a stalemate, Phala showed his class to create the two goals for Matsatsantsa. AmaTuks punished on each of the goals for two defensive mistakes (one from Shoyisa and Kekana) at late stages in the game.